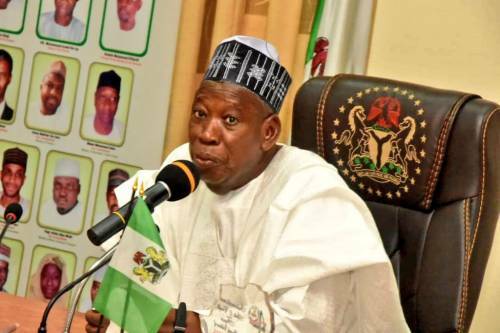 Abdullahi Ganduje, governor of Kano, cannot statistically deliver five million votes to President Muhammadu Buhari in his state as he earlier promised. An analysis by TheCable of the latest statistics released by the Independent National Electoral Commission (INEC) shows that while Kano has 5,457,747 registered voters, only 4,696,747 collected their biometric cards. If every voter in Kano were to vote for Buhari, Ganduje would still miss his target by 303,253 votes. Buhari got 1.9 million votes in 2015 and has always won in the state since 2003 when he first contested in the presidential election. In Lagos, there are now over 1.7 million fresh PVC holders — the highest increase across the country. In 2015, a total of 3,799,274 PVCs were collected in Lagos, compared to 5,531,389 in 2019. INEC’s updated statistics gave the exact number of PVCs collected across Nigeria as of February 11 as 72,775,585 out of 84,004,084 registered voters — meaning 86.63 percent collection rate. In 2015, there were 68,833,476 registered voters and 56,431,255 cards collected, representing 81.98 per cent collection rate. The overall percentage of collected PVCs increased by 4.65 percent point. number of registered voters per state.